With the economy at current levels, everyone has debt that they are trying to get rid of. The best way to stay ahead of a budget is to reduce the monthly outflow. Of course the biggest outflows to curtail are those high interest unsecured debts. 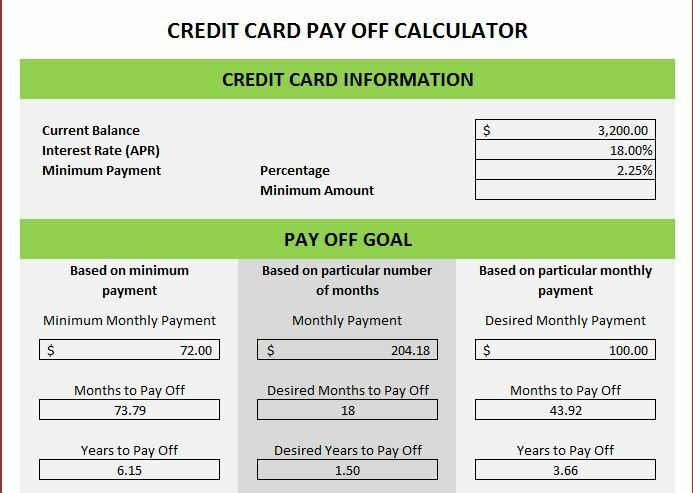 If there are credit cards that you would like to get paid off sooner, this credit card Excel template can take the guess work out of figuring out how to reduce your debt. This template is completely free and customizable. Users will find that the formulas are not locked, so that they may make adjustments to their individual situations as necessary. Simply click the link and download this credit card Excel template with the listed link, and be on the way to a quick debt reduction plan. Enter your current balance, interest rate (APR) and either minimum payment percentage or standard amount. Be sure to review your credit card agreement to find if the minimum payment is based off a percentage or a standard number like $35.00. Usually credit card companies require both. These will be listed as a percentage unless falling below the minimum. In the payoff goal section, enter either the desired month to pay off or the desired monthly payment. You can enter amounts in both these fields if you would like a comparison. After all the data is input you can run a comparison on the three columns. The first column will show how long it will take to pay off the card using the minimum monthly payment. At the bottom, the total interest paid for this scenario is displayed. The second column will display that information for a set number of months and the third column will display that information for a set monthly payment. This credit card Excel template is a great tool to begin calculating how to reduce debt and to see what effects debt reduction can accomplish for bottom line spending when compared to minimum monthly payments.